T. Hammerschmidt, J. Koßmann, C. Zenk, S. Neumeier, M. Göken, I. Lopez-Galilea, L. Mujica, S. Huth, A. Kostka, W. Theisen, R. Drautz. 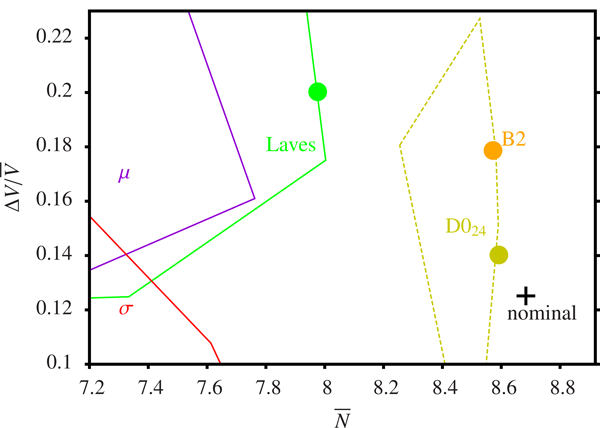 Analysis of experimentally observed precipitates in as-cast Ni-base superalloy ERBO-Co0 in terms of a structure map using average number of valence electrons (N) and differences in atomic size (V). The circles mark local chemical compositions obtained by TEM. The precipitation of topologically close-packed (TCP) phases in single-crystal superalloys is highly undesirable due to the detrimental effect on the mechanical properties. The TCP phases bind atoms responsible for the solid solution strengthening of the γ phase (Re, W, Mo), as well as elements that are important for the formation of the γ' phase (Ti, Ta). A thorough understanding of TCP phase precipitation is therefore a prerequisite for the design of future superalloys. The thermodynamic stability of TCP phases as bulk material is meanwhile well understood. However, little is known about the factors that govern the stability of the experimentally observed precipitates of TCP phases within the superalloy matrix. The focus of this paper is the role of the local chemical composition for the stability of TCP phase precipitates. We combine experimental measurements of the local chemical composition of TCP phase precipitates in the Ni-base superalloy ERBO-1 and the Co-base superalloy ERBO-Co0 with a theory-guided interpretation of the structural stability of bulk TCP phases. The experimental characterization of the microstructure and the crystal structure of the precipitates are based on scanning electron microscopy (SEM) and transmission electron microscopy (TEM). The local chemical composition is determined by energy-dispersive X-ray spectroscopy (EDX) and electron probe microanalysis (EPMA). The measured local chemical compositions are assessed regarding the likelihood of TCP phase formation by determining their location in a structure map of the stability of bulk TCP phases. This establishes a direct link between the measured local chemical composition of TCP phase precipitates and the phase stability of bulk TCP phases at this composition. By converting the measured local chemical composition into structure-map coordinates, we effectively construct a compound map that indicates the regions in the microstructure that are prone to TCP phase precipitation. Analyzing the intermetallic precipitates in more detail, we find that the chemical compositions of the TCP phase precipitates would be expected to form the same TCP phase as bulk material. This suggests that the observed precipitates of TCP phases can be regarded to be in a local thermodynamic equilibrium. The challenge of predicting TCP phase precipitation in superalloys is hence reduced to the prediction of the local chemical composition during casting, heat treatment and service.